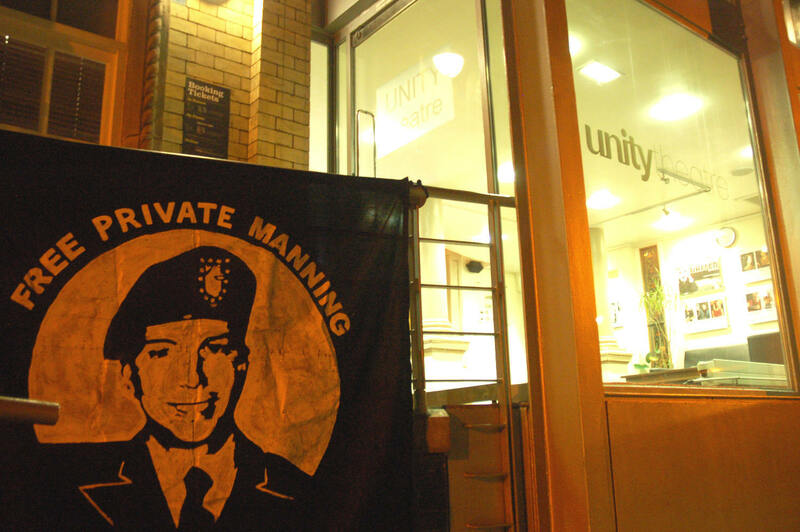 With the trial over, ongoing mainstream coverage of Manning’s story next to zero and complaints about the incarceration of this principled whistleblower barely audible, a play that brings the issues to a wider audience and Manning’s name back into the public consciousness at any level is to be applauded. As The Radicalisation of Bradley Manning at Aberystwyth University brought the issues home to Welsh students back in November, so Molino Group’s excellent play Desert is doing the same important job with audiences around the country right now. Below: the cast of Desert, Lucy Farrett and Giles Roberts, at our stall in the foyer of the Unity Theatre, Liverpool. The original 2012 production of Desert is reviewed here on WISE Up and the play has now been updated to include recent developments. The WISE Up network has had a presence throughout this tour with an information stall and participation in discussions or question and answer sessions after selected performances. Last week, the play ran for three nights at the Unity Theatre in Liverpool. 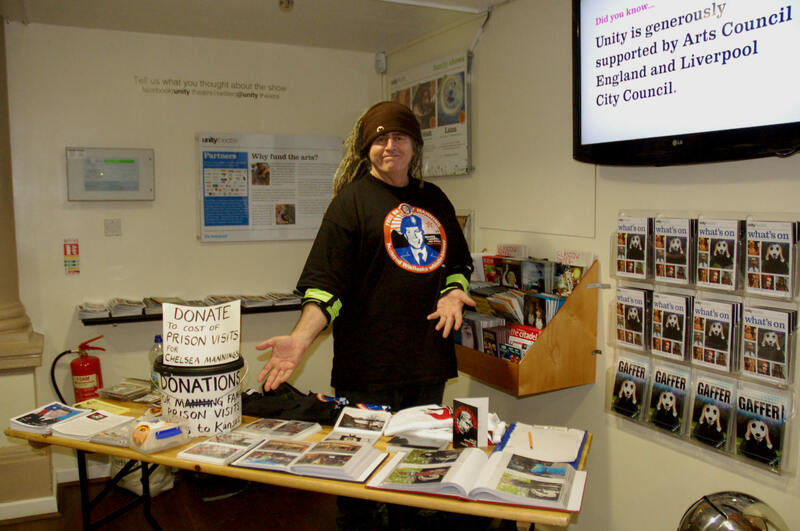 As well as having the information stall in the foyer each night, Family Fund flyers were included with the programme and we received a number of cash donations for the fund. Anti-war activist and former prisoner of the US Ciaron O’Reilly (pictured below) spoke after Wednesday’s performance about the huge significance of Manning’s actions, about the solidarity work that has taken place over the past three and a half years in Wales, Ireland, Scotland and England with little assistance from funded anti-war and human rights organisations, about the recent connections we have made with members of Manning’s Welsh-Irish family and the significant support, recorded in this blog, that we have been able to offer them since the trial ended last summer and Manning was sentenced to 35 years behind bars. The play moves on to Bristol for three nights at the Wardrobe Theatre starting Bank Holiday Monday 21 April. The after-show discussion is likely to be on Wednesday 23 April. Tickets are £5 and can be reserved here or just turn up on the night. In July, the Molino Group will be at Latitude Festival in Suffolk, bringing the play and Chelsea Manning’s story to a whole new constituency of festival-goers. 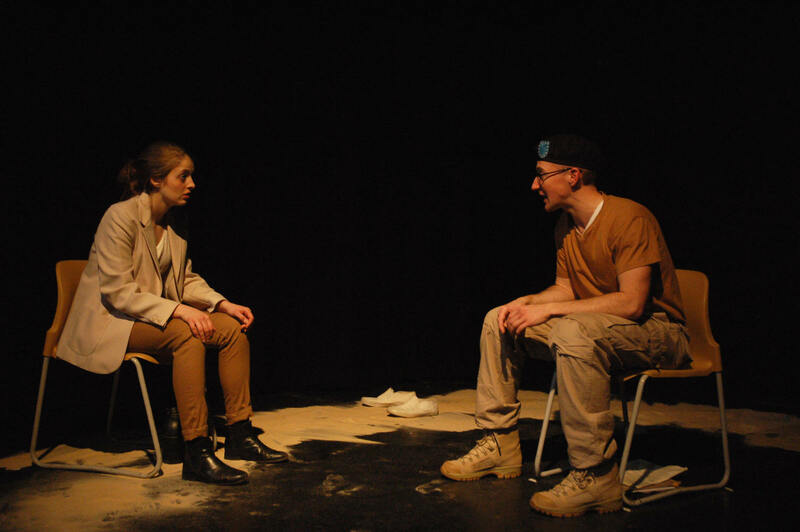 Desert focuses on imagined communication between Manning, played by Giles Roberts, and a young woman (‘Her’) played by Lucy Farrett who stumbles across a ‘Free Bradley Manning’ demonstration in London and wants to find out more. 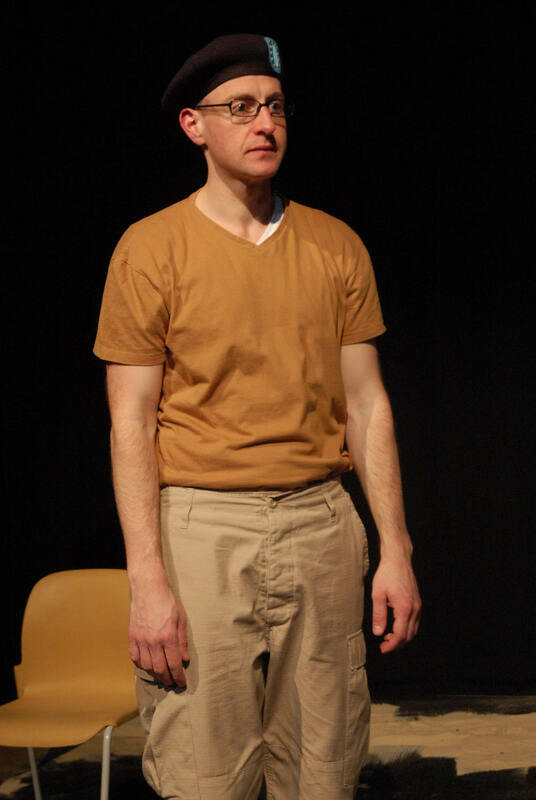 The interplay between her innocently open questioning and Manning’s frustration and dark thoughts while held under conditions of torture in Quantico creates a powerful and intimate dynamic in the first part of the play. Later, Farrett assumes a number of other parts, notably Manning’s attorney David Coombs in an emotive scene where he tries to persuade Manning to deliver some kind of ‘apology’ to the court when faced with the prospect of a theoretical 90 year sentence. …This play doesn’t shout its feelings at you, nor does it romanticise or demonise Manning, for which it can be credited. It simply retells the facts of her story in a way that humanises a figure that we can no longer see nor hear from. And that’s the point. It’s through productions like this that Manning, hidden from sight at Fort Leavenworth possibly for decades, is kept alive for us here on the outside. Desert is a timely reminder of the issues and the importance of offering our solidarity in whatever ways we can. 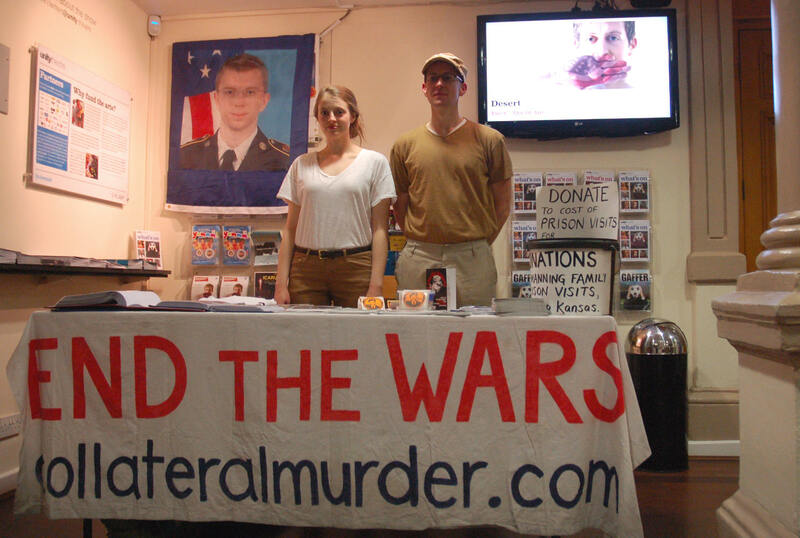 Gallery | This entry was posted in Reports and tagged Bradley Manning, Chelsea Manning, Ciaron O'Reilly, Desert, Liverpool, performance, The Molino Group. Bookmark the permalink. 2 Responses to ‘Desert’, a play about Chelsea Manning, is on tour. Don’t miss it. Nowadays,it is fashionable to describe servicemen and women, as heroes for having simply done their job and carried out their orders, albeit in sometimes dangerous situations..They may deserve some credit for that but most of us would try to do our duty and not let our comrades down, That does not make us heroes! Real heroes are people who act of their own volition, who risk their lives and future, to do what they know and can see, needs to be done:, without , or even against, orders : without back up or support; and in the full knowledge that their action will provoke disastrous personal consequences. People like Chelsea Manning and Edward Snowden ,who put their lives and freedom on the line to do what their intelligence and concience,, told them was necessary. These are the heroes of our time. We are deeply in their debt .We should honour and support them. and fight for their rights and freedom.